All selectable fields are listed here. All of the fields specified for sorting are listed here. 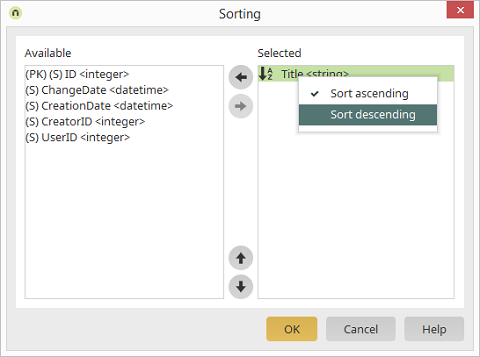 Adjust the order of the sorting fields. The following applies here: The top field is the primary sorting criterion. The subsequent fields are then applied to the sorting of the top field. Right-click to define whether the list should be in ascending or descending order. If you place the mouse cursor over a field, the name of the data group that contains the field will be shown in the tooltip.